TWD #53: Two peanuts walk into a bar. One was a salted. I laughed. I hope you laughed too. My Chocolate Armagnac Cake turned into Caramel Crunch Bars! Apologies to my TWD bakers and our TWD host this week, Lyb of And Then I Do The Dishes, but to be honest I wasn’t inspired by prunes (eeewww!) and I didn’t have any Armagnac (although that wouldn’t have stopped me on its own. You can never had too much [cooking] alcohol in the house right?). You can find the recipe on her blog. Since I missed the caramel crunch bars last week I decided to make those instead. The caramel crunch bars were on my short list of recipes to make when I was hosting back in October but I decided to go with the chocolate cupcakes so I am STOKED that Whitney of What’s Left On The Table chose them! I decided pretty quickly that I didn’t want to have 56 caramel crunch bars laying around so I knew I’d half the recipe. I was proud of myself for remembering while I was making the bars to 1/2 each ingredient b/c its been known to happen that I’ll half the flour but add the full amount of salt. Ugh! But just as I was patting myself on the back for making sure each ingredient was the right fraction I realized that I didn’t have a smaller than 9×13 cake pan. 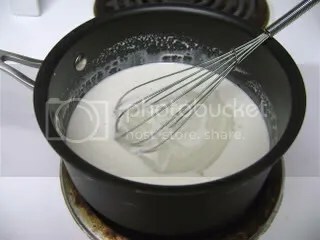 *smack head* So imagine me; pacing back and forth in the kitchen, trying to find a pan that would work while my KA is begging to be emptied of caramel crunch bar batter. Uh… uh… Springform? 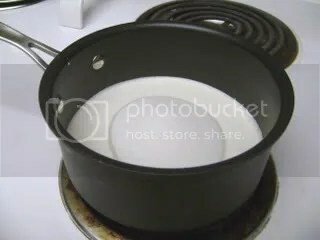 6″ round cake pan? tart pan? 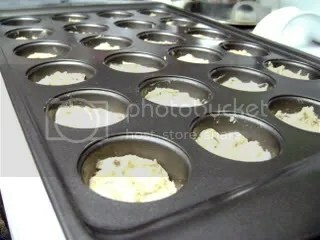 cupcake pan? I need a sous chef. Indulge in life a little more. Make the whole recipe. 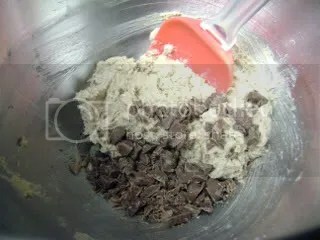 I used Ghiradelli milk chocolate chips that I chopped up into smaller pieces. I put about 1/2 tbsp of dough into each mini cupcake well and baked for about 7-8 minutes. I topped each “cup” with more milk chocolate but they were small enough that they melted quickly so I didn’t have to put them back in the oven. After I spread the chocolate over the “cup” with a small spatula, I topped with homemade toffee bits. He was a big fan of the hint of coffee and chocolate combination but picked off the toffee. Homemade Toffee recipe after the cut. In a saucepan over medium-high heat, bring everything to a boil. 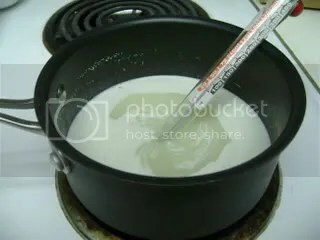 Stir until the sugar is dissolved. 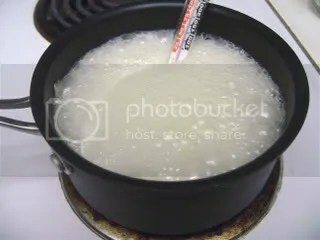 When the mixture starts to boil with vigor, do not stir. 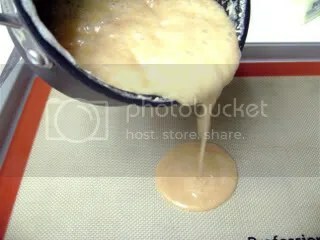 Decrease to medium-low heat and let the mixture boil until the mixture turns a deep nutty brown, about 20 minutes. 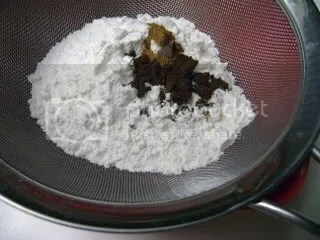 Slowly pour onto a prepared baking sheet (Silpat or you could use parchment paper sprayed with PAM) and let it to cool. 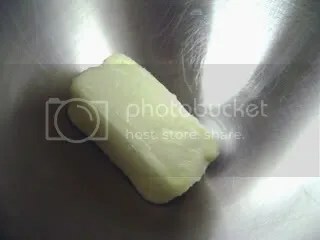 After the toffee has cooled, break it into small chunks. Entry filed under: Tuesdays With Dorie. Tags: caramel crunch bars, toffee. Fun post! I LOVE toffee, it is my favorite! Me too! Love the caramel-y flavor with a little crunch! Your little cupcake versions look too darn cute! I made the cake with prunes and rum. The prunes didn’t bother me but the rum was way too strong for me. It was fun to flambé though! My caramel crunch bar dough is still in the freezer and I made it 3 weeks ago! 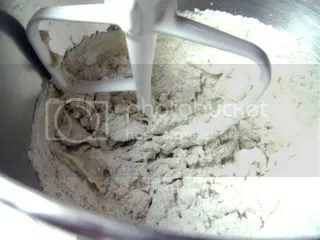 I’m dying to bake something..,anything! Why in the freezer? 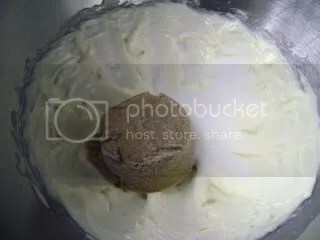 Bake that dough up! My caramel crunch goodness is LONG gone by now. Wow! You made your own toffee. You rock! Those looks yummy! I am amazed by the hommade toffee! Yum! ‘Tis OK, sweetie! I knew a lot of people would have an “eewww, prunes!” moment. But you should try it sometime, if only a fraction of the recipe, you can’t taste the prunes at all. 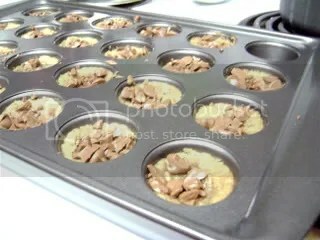 :) Your little caramel cups look fantastic! they look super cute as cups! :) necessity is the mother of invention! hehe. nice job on the toffee, i went the homemade route too and could NOT stop eating it. How funny you are!! You should have made this cake and used raisens if you didn’t like prunes. It was GREAT. Oh girl, you have to make these. So freaking addictive. Even better the next day… I ate… *counting on fingers* … alot. 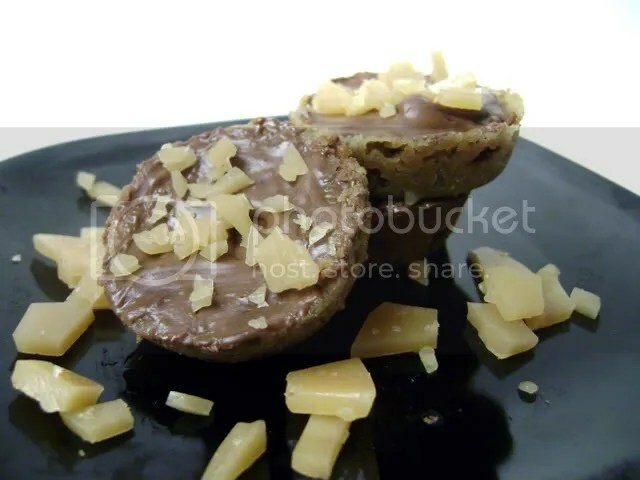 Neat idea to make crunch cups! 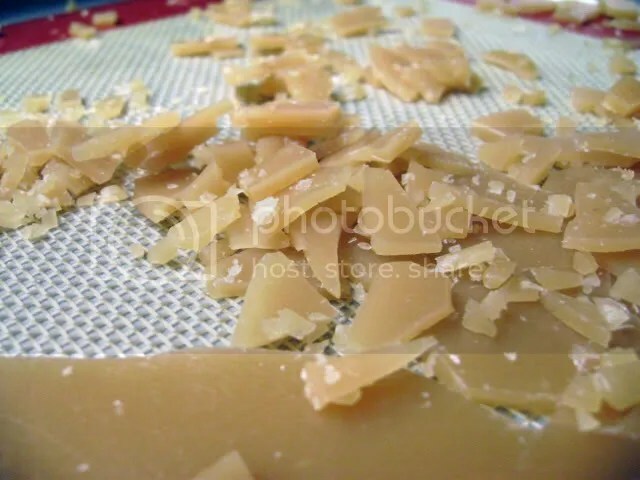 I love homemade toffee… yum! 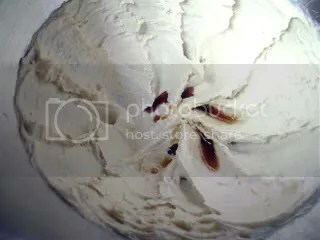 I still have some of these in the freezer – I am currently devouring the chocolate prune armagnac cake! And I just saw the previous post with pics of your bunnies – they are absolutely lovely. the cups are a great idea. You coudlnt actually taste the prunes in the armagnac cake – and this is coming from someone who does not love prunes in the least! Nice job thinking on your feet with the caramel crunch cups! They look great. As a fan of prunes I have to campaign that you give the cake a try. It’s really good and as you will read on most posts, the prunes aren’t identifiable. So glad that they turned out well! Whenever I halve the recipe, I always wish I didn’t, but my thighs always thank me! Dangerously Delicious little luv cups. he he I like them. JEEEZZZ!!!! I remember all the dumb peanut jokes from teenagehood. Peanut sat on a railroad track……. Great job on the rewind. Cute! Mini cupcakes are my favorite. Yours look wonderful! Beautiful job! Definitely one that’s a keeper, so I’m glad you got around to making it. And I love the little minis too (as I’m sure you’re aware of :) ).